First real rain of the trip and also first experience with Russian bureaucrats. Because of visa requirements everyone must be booked on a tour in order to leave the ship and visit St. Petersburg. We have 2 days here but there is much to see and a tour is the only way to go. My research took me to Alla Tours- very well recommended, much less expensive than the ship tour and much smaller groups. We were 14 in our group and our tour leader was Alexandra, a funny, sweet and very knowledgeable guide who was full of wonderful stories about the fascinating history of St. Petersburg. Our driver had lived in Lancaster PA for 5 years and had visited Hershey! Of course I liked both immediately. The bus was a comfortable Mercedes. Holly's cough is almost all gone so that is a comfort! Our day was to begin with a hydrofoil ride to the incredible gardens, palaces and fountains of Peter the Great. Alas the rain meant the bus instead. Along the way we learn about the history of the city founded by Peter. The Second World War is called the Great Patriotic War by Russians and May 9 is a national holiday celebrating their victory over the hated Germans-the losses were enormous and St. Petersburg was surrounded by Germans and about a million residents in the city died of starvation. Museum and palace workers risked their lives to protect precious art works from the Germans and little boys of 10 or 11 years went on the roofs to clear off the firebombs reigning down on the city every night. 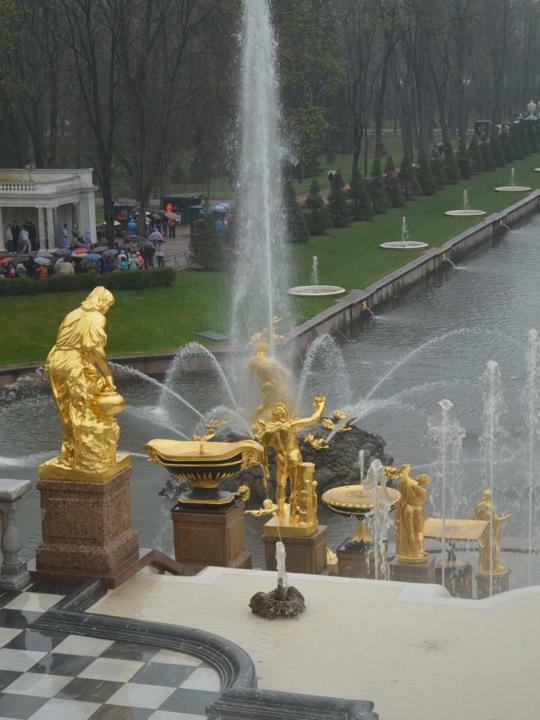 Arrived in Peterhof home of Peter's summer castle-we walked in the gardens and saw some of the amazing fountains. Peter was fascinated by water and had over 600 including the photo here. He had trick fountains that set off streams of water on unsuspecting guests dressed in all their finery. He thought that was great fun! Had a nice lunch in a local restaurant which included borst with sour cream just like at home although we eat it cold. A highlight of the afternoon included a visit to Catherine's Palace and the famous Amber Room which is room covered with intricately carved amber panels.